We hope you enjoyed all John’s puzzles from last week, which are fully contained in this PDF. If you solved the complete set, Grandmaster Puzzles would like to reward you with a copy of the seminal reference “A Dictionary of 4,573 Crucial Cross Words and their Clues”, coauthored by John Bulten. This out-of-print 1987 work was the first crossword dictionary we know of to rank words using the methodology now standard for “The New York Times”. All copies will be personally signed by J.B.! To obtain your copy, simply enter the proper product code (read: the answer to the hidden puzzle) in the applet below before midnight, April 19th (three weeks from today) May 3rd May 17th, so that we can verify your address via email. Solvers will also be recognized in a later post. As with our first Hidden Contest, this is a challenge of logic and observation. We’ll be adding hints here each week until the close of the entry period. Hint 1 (4/5/2015): It’s all good, but I recommend 138956247. Hint 2 (4/12/2015): To obtain the product code, simply follow the correct instructions in the correct order. A review of other puzzlemaster debut weeks may help out. Hint 3 (4/19/2015): Following the example of other puzzlemasters here, John tried to leave his mark on these puzzles. After finding out what that means, you are looking for an answer with one word followed by several numbers. (4/26/2015): No extra hint today, but we’re sharing the official solution packet for the week’s puzzles which may be useful. Hint 4 (5/3/2015): You are looking for a single element in common across all of the puzzles. It may be easiest to find this by looking at the solutions that include shading (BACA, Slithersweeper, and Tapa). Next week will be a regular variety mix with puzzles from six authors. All the puzzles from last week’s Castle Wall collection can be found in this PDF. 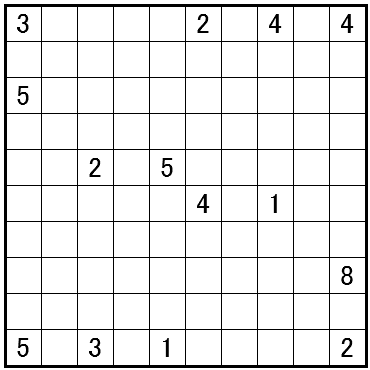 We had 57 solvers for Dr. Sudoku’s 200th puzzle contest. Two random numbers were selected from 1-57 using random.org marking solvers 30 and 52 as the winners of a free puzzle book. Those lucky solvers are (30.) Projectyl and (52.) phlebowitsh. This next week will feature both letters and numbers. Specifically, a set of Pentominous puzzles by Grant Fikes and Sudoku puzzles by Thomas Snyder. The bonus puzzle for our high-level supporters will also be a Pentominous by Grant Fikes. Note: This puzzle is a contest puzzle. All correctly submitted answers (in the applet below the puzzle) before November 9th will be entered into the contest drawing. Two solvers will each get a Grandmaster Puzzles/Thomas Snyder puzzle book of their choice. 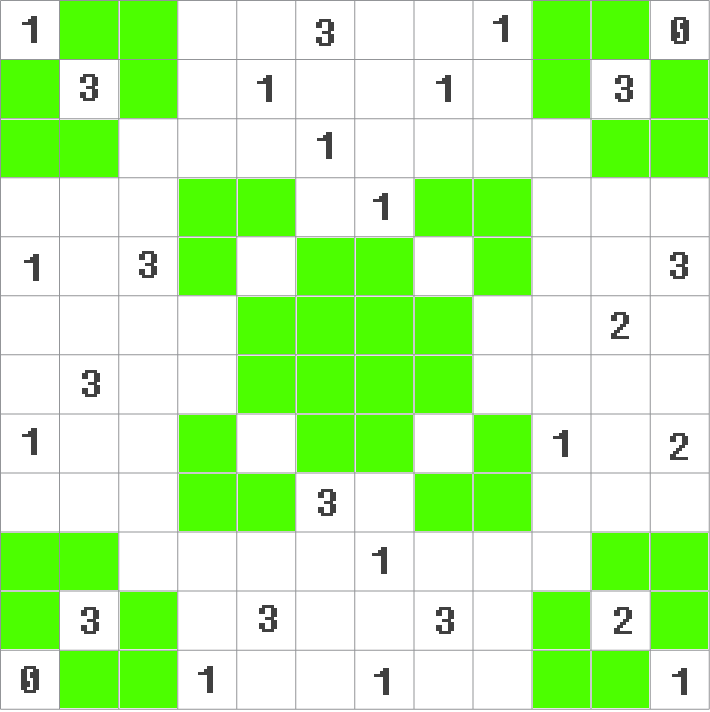 Author/Opus: This is the 200th puzzle from Thomas Snyder, aka Dr. Sudoku. Answer String: Enter the final answer as a single string of twelve capital letters. Note: Follow this link for classic TomTom puzzles. If you are new to this puzzle type, here are our easiest TomTom to get started on. On May 26th, in recognition of our Contributing Puzzlemaster Grant Fikes’ birthday, a Sunday Surprise contest was posted. 29 solvers have completed the puzzle and all were added to a drawing Grant describes here. The winner of the random drawing is FoxFireX, who will receive a copy of Battle of LITS. Today’s surprise marks the occasion of Grant Fikes’ 26th birthday. Grant has written a surprise puzzle hunt-style puzzle that will solve to a two word answer. 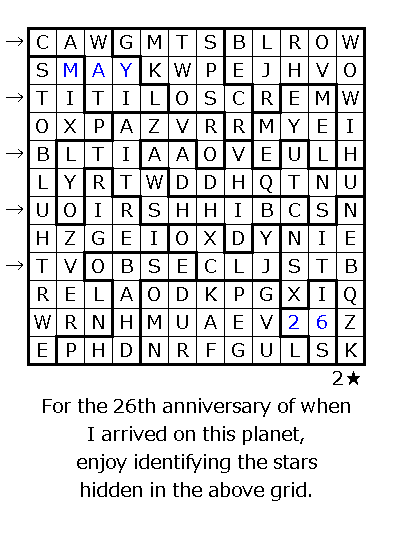 This is likely more challenging than our earlier “Word Search” surprise on April 1st, but we hope it is enjoyable to those who give it a shot while celebrating Grant’s birthday. Note: the first 26 solvers (or all those who solve it within a week if fewer than 26 solve it by then) will be entered into a random drawing for a copy of Grant’s “Battle of LITS” board game. Answer String: Enter the two word answer in all capital letters, with a single space between words. Update (6/2/13): There have been 27 solvers in the week since this puzzle posted and all of those names will be placed into a drawing sometime shortly. Watch here for further updates. **While this was initially not a numbered Grant opus, we are calling it #48 for our site count. In addition to FoxFireX’s incredible sudoku gift that he made for someone’s birthday (some puzzles are meant to keep more private), we got three other submissions for our first Hidden Contest. We’re posting them here in increasing order of difficulty. First up is an “Anti-Symmetry” Nurikabe from Giovanni P. where every clue that is odd/even has an even/odd clue in the corresponding symmetric place. Standard Nurikabe rules are all you need for this challenge. Next up is a real RARITY for this website, a Shakashaka. For the general rules, we’ll direct you to Nikoli.com where the puzzle originated. Here, Bryce Herdt has made a cipher version of the puzzle. The letters AIRTY each stand for a different number from 0 – 4 which the solver must determine. Finally, the hardest of the bunch, is an intriguing variation called “Sudoku Slitherlink” by its designer Scott Handelman. In addition to standard Slitherlink rules, a different number from 0-3 must go into each green cell. No number in a green cell can repeat in that row or column. As Scott warns, this is one of the hardest puzzles he’s constructed and, from his original post, he’s “still kinda shocked that the middle just kinda ‘works'”. 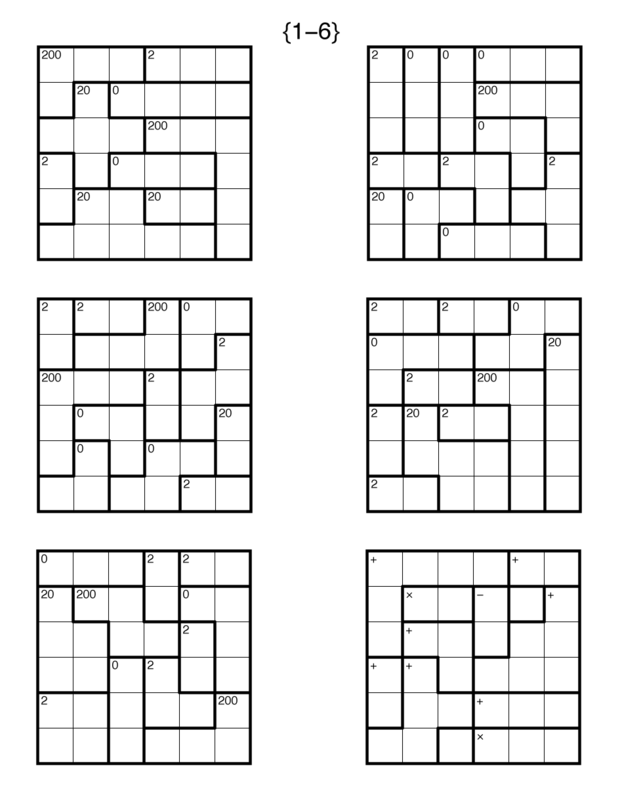 All of these puzzles are grouped in this single PDF. If you enjoy these puzzles, please comment here and say so, thanking each of the authors. As contest entries, these didn’t go through editorial review (except making sure there was a single answer), but we found them all quite interesting and worthy of being some of the first puzzles from other authors to appear on this web-site. We’re considering keeping Sunday open for “guest” submissions each week from new puzzle authors. And once we get through a stack of puzzle submissions for The Art of Puzzles, more authors will be appearing throughout the week too.